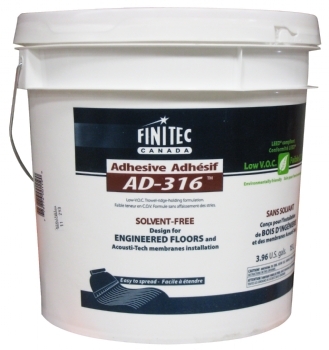 AD-316 is a high performance rubber based adhesive without solvent. Specially designed for glued membrane, laminate or wood floor on concrete or wood subfloor or over AcoustiTECH™ acoustical membranes. Use it for adhering an acoustical membrane or engineered wood flooring to concrete or to a wood surface (plywood or OSB) and engineered wood glued on membrane.